Premium Rose Gold finishing. 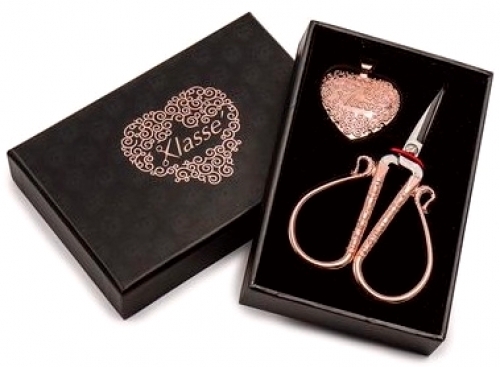 4 inch (10cm) embroidery & needlework scissors. Fine and sharp point for precision and accuracy. Ideal for cutting fabric, thread, and needlework yarn. Metal heart pendant thread cutter. Slotted grooves contain a sharp blade for a safe cut. The notches are small enough to prevent anyone from cutting themselves. Distinctive antique design and finishing presented in premium Klasse gift box. Perfect gift idea for different occasions, celebrations and seasonal holidays.